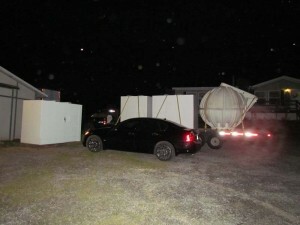 A steel-safe room located above ground is a hardened structure specifically designed to meet FEMA criteria and provide “near-absolute protection” in extreme weather events. These rooms are self-contained units that are brought into your existing home or a home you are currently building. They are bolted into your concrete foundation and come in a multitude of sizes. They can even be customized to your liking. 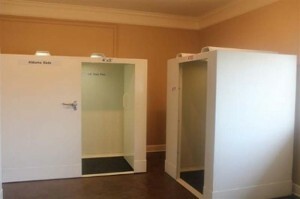 A basement is the ideal location to install a steel safe room, but access for handicapped or physically challenged individuals may be limited. The flood risk of your location may also affect whether it is appropriate to place a safe room in your basement. If your house or neighborhood is prone to flooding, the basement may not be an appropriate location for taking refuge. Some strong tornadoes have resulted in loss of floor framing, collapse of basement walls and death and injuries to individuals taking refuge in a basement without the steel safe shelter. The basement is ideal for homes in high areas. However, we install most of our steel safe rooms in existing garages. Most garages are on the first floor which allows for easy and dry access. The doors on the steel safe rooms open to the inside which will prevent occupants from getting trapped inside. All our doors are handicap accessible. Is an underground safe room safer than one above ground steel shelter? 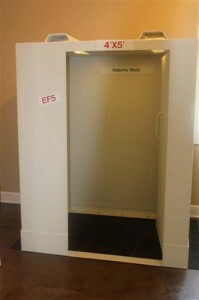 As long as a safe room is designed to meet or exceed the criteria in FEMA P-320 and FEMA P-361, it will offer the same near-absolute protection whether it is above or below ground. What are the benefits of a steel safe room? You don’t have to be exposed to weather and flying debris during a natural disaster. You’re in an above ground steel safe room for a shorter period of time, because usually you want to get in your underground storm shelter before the rain comes. You can stay in the comfort of your home longer, because the room is easily accesible from your house. 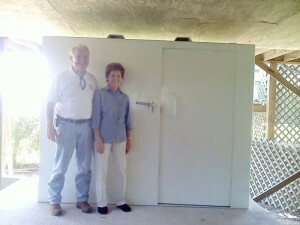 Above ground steel safe are more affordable than an underground storm shelter. The installation time for this shelter is a maximum of 2 hours. Units exceed FEMA 320/361 and ICC-500 standard specifications. Installed on your concrete foundation with 20 5/8′ wedge anchors. Each anchor bolt rated for over 14,465lbs of stress. We can build virtually any size you require. Interior locking box seats can be installed in any unit. Electrical outlets for: fans, TV, Television, small refrigerator, battery charger, lights or anything else you may want inside your shelter. 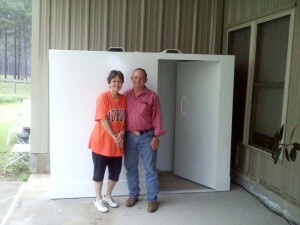 We can build fireproof gun safes to the inside of the shelters.